Wishful thinking can be terribly dangerous for company profits. Taken to extremes, it can lead them into bankruptcy. None of this will be a surprise to anyone who has followed the recent development of China’s economy. But it will come as a tremendous shock to those company boards and investors who have believed the myth that somehow China was about to become middle class by Western standards. Key to this strategy review process will be to ignore published data for China’s GDP. As the world’s media are beginning to recognise, this is completely fictitious. How, after all, could any country possibly present accurate GDP data within 2 weeks of the end of a quarter – and never need to revise it? Similar developments are taking place in the property sector, as the government slowly brings shadow lending under control. This means the end of the property bubble which allowed people to buy new cars that they couldn’t afford out of their normal income. Instead, the profitable companies in the future will be those who focus on the used car sector. This is likely to grow four-fold between 2014-2010, from 6m sales to 25m. 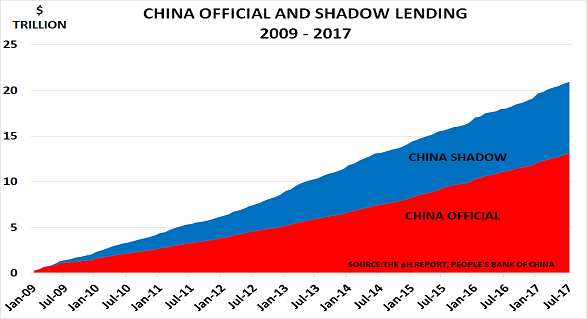 The good news is that the new growth areas for China’s economy are becoming increasingly obvious, as the lending bubble disappears. The key for those focused on consumer markets is to produce products that are affordable for people on average earnings. This means urban residents with incomes less than $4k, and rural residents with incomes less than $1300. One company I know is seeing excellent growth in affordable bedding sales; everybody values a good night’s sleep. Many companies and investors have preferred to believe that President Xi was only paying lip-service to his concept of the New Normal. But it is now clear that he will not repeat the stimulus policies which have created today’s problems for the economy. And as the Chinese phrase says, “if the lips are gone, the teeth will be cold”. Since 2005, total auto lending has thus risen 4700% from just Rmb 6bn to Rmb 282bn by Q1 2014. Direct retail loans to customers grew 15000% from Rmb 1.3bn to Rmb 195bn over the same period. This highlights how China has seen the auto industry as being key to maintaining employment, and thus a priority area for support. However, there are increasing indications that the nature of this support is changing. Past performance may well prove an unreliable guide to the future. One sign is that many more cities are introducing purchase restrictions on new car sales to reduce pollution. Beijing, for example, will only allow an extra 400k cars on the road between now and 2017, for a total of 6m. A second sign is the decision to strip most officials of their government car, and replace it with an allowance of $80-$210/month, depending on rank. This will be bad news for overseas brands, which have held 80% of this $675m market. Audi will be badly hit as it supplies around a third of the volume. There are also signs that dealers may gain power versus manufacturers – at the moment, they can often be forced to hold vast inventory. China Daily reports this has been rising rapidly in recent months, with some dealers now holding more than 5 months stock. The final challenge also relates to pollution. The government currently plans to take 6m high-polluting cars off the road this year, and we can assume it will subsidise their replacement – thus helping to maintain volumes. But it is likely that much of this support will be tied to the use of electric cars, with refuelling costs set to be 30% below gasoline prices. Urban areas with fixed routes for official cars will now have to buy electric cars, whilst those suffering extreme cold can buy hybrids. And subsidies (including exemption from the 10% vehicle tax) will only be offered for cars costing up to Rmb 180k ($29k). International car companies, and their suppliers, will need to move fast to realign themselves with this new direction. In the past, the money was made by selling high-priced cars to government officials and those benefiting from the property bubble. Since then the problems have worsened, to the point where almost everyone now agrees that they are creating a major political problem. The new leadership simply has to solve this, if it wants to remain in office. Beijing and the 6 northern provinces have now been shrouded in smog for 6 days, and on Wednesday the US embassy reported that the levels of PM2.5, the small particles that pose the greatest risk to human health, were “beyond index” at 512. The World Health Organisation recommends day-long exposure levels of no more than 25. Yet Bloomberg reports that the level has been above 150 since 19 February. And next week, of course, sees the start of the annual meeting of the National People’s Congress in Beijing, where the problems are certain to receive major attention. Of course, these problems are not unique to China at its stage of development. As the blog noted a year ago, pictures of the its smog today mirror those seen in the West until the 1960s, when governments finally began to recognise that economic growth was unsustainable if it meant millions of people died as a result. The good news is that the smog is expected to finally lift over the next few days as a cold front comes in to clear the air. But Beijing residents know it will not be long before the problems re-emerge. And as the blog noted in its recent Research Note, the problems will get worse, not better, until the polluting factories are closed down and vehicle pollution reduced. “Demonstrated that air pollutants adhere to greenhouse surfaces, cutting the amount of light inside by about 50% and severely impeding photosynthesis, the process by which plants convert light into life-sustaining chemical energy”. China is clearly now preparing to shift away from its current ’growth at any cost’ model of economic growth. This must result in a major slowdown, as it will take time to build the new, less-polluting, factories and power stations. Car ownership must also move down the priority list. Average incomes in China are very low by Western standards, and certainly not “middle-class” as the blog discussed yesterday. It is also easy to forget that almost half the population still lives in rural areas. Official data shows their incomes have shown major growth over the past 20 years, but are still less than a third of urban incomes today. This comparison identifies the real markets for companies aiming to target the 642m people living in rural areas. Of course there are wealthy people in rural areas. But there are not enough of them to form more than a niche opportunity. The real market is thus for $50 refrigerators and similar very basic appliances. “One-sixth of China’s arable land — nearly 50 million acres — suffers from soil pollution. More than 13MT of crops harvested each year were contaminated with heavy metals, and 22m acres of farmland were affected by pesticides”. The situation is particularly acute in Hunan province, which produces one-sixth of China’s rice and is also a major producer of nonferrous metals. Pressure to maintain economic growth means that the province is also China’s leading polluter of cadmium, chromium, lead and nonmetal arsenic. Companies who look through the middle class myth, and focus on these opportunities will be the major winners for the next few decades. Pollution is, unfortunately, one of the downsides of industrial development. Luckily for us in the West, it is mostly a distant memory. But as the BBC picture on the left reminds us, Britain was paralysed by ‘smog’ (a lethal mixture of fumes and fog) only 50 years ago in December 1962. Now it is Beijing’s turn, as the Financial Times picture on the right shows. 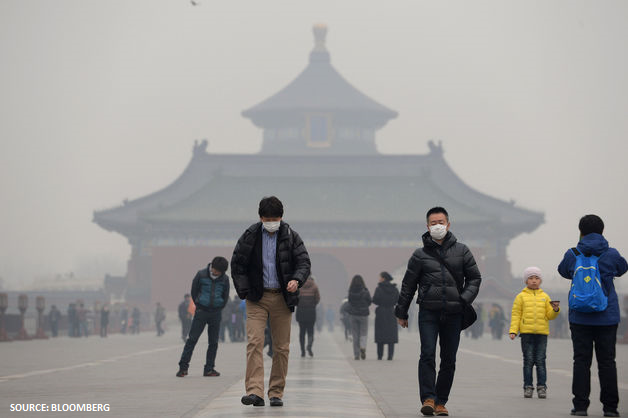 As the paper writes, it has been “a winter of terrible pollution in Beijing“. Levels of the most toxic types of smog reached 40 times that recommended by the World Health Organisation (WHO). Whilst a new joint study between the WHO and leading universities found that “outside air pollution contributed to 1.2m premature deaths in China in 2010, almost 40% of the global total”. Unsurprisingly, pollution has therefore shot up the government’s agenda in recent months. It is a major factor behind the limitation of auto sales in the major cities. But clearly more needs to be done, including the closure of the most polluting factories. In turn, of course, this will have a major impact on economic growth.